Cinderella is not really a personal favorite fairytale, what with Cinderella being physically and emotionally persecuted, bad sisters basking in the joy of making other people miserable, and the prince, er, not exactly an admirable character. I understand they are part of the fairytale formula, but that does not mean I have to like it. Still, the way her story has survived and adapted in different media is proof of how memorable Cinderella truly is. Cinderella is a folktale that shows triumph of good over evil. It tells the story of a woman who was forced into unfortunate circumstances but nature cooperates with her wishes for a better life. There are so many variants of the story, such that even the Philippines is included in the Wikipedia list and Aarne-Thompson-Uther Folktale Type 510A and Related Stories of Persecuted Heroines list of these variants. Regardless of how many variants there are, the name Cinderella has become the archetypal name. Her story is said to have been published first by Charles Perrault in Histoires ou contest du temps passé (1697), and later by Brothers Grimm in Grimms’ Fairy Tales. Perrault’s story is what is commonly adapted. From my point of view, it is more likeable and less realistic. All the affable elements we want our young children to know are present, including a charming Cinderella, treated as a servant; a pair of not-so-evil-after-all sisters; the fascinating ball gowns; rodents-turned-servants; the fairy godmother; some cozy magic with a curfew; a rich prince who gets so (stupidly) tongue-tied at the sight of Cinderella’s beauty that he forgets to ask for her name; and the thrilling slipper test. However, have you read Jacob and Wilhelm Grimm’s version of Cinderella? It has more blood in it than the dainty animated version by Walt Disney, such that the sisters are abnormally cruel even to themselves to the extent that they are eager to cut of their toes and their heels in order to fit in the shoe that is made of gold, not glass. Even the birds, supposedly gentle, are like vultures in the old text, pecking out the eyes of the wicked sisters, rendering them blind for the rest of their lives. In my mind, it was like watching an account of the Game of Thrones series, downplayed but nevertheless gory. Maria and the Golden Slipper. This is found in Dean S. Fansler’s Filipino Popular Tales. His source is Dolores Zafra, a Tagalog from Pagsanjan, Laguna, who learned about the story as a little girl. It contains the usual facets of Perrault’s version, with Maria as Cinderella, except for the presence of the fairy godmother. In this story, the spirit of Maria’s mother is reincarnated in the body of a crab that is cooked, eaten, and shell planted to grow into a gift-giving talking tree. When night came, Rosa and Damiana went to the ball, and Juana retired for the night as soon as her daughters were gone. When Maria saw that her aunt was sleeping, she went into the garden and asked the tree for what she wanted. The tree changed her clothes into very beautiful ones, and furnished her with a fine coach drawn by four fine horses, and a pair of golden slippers. 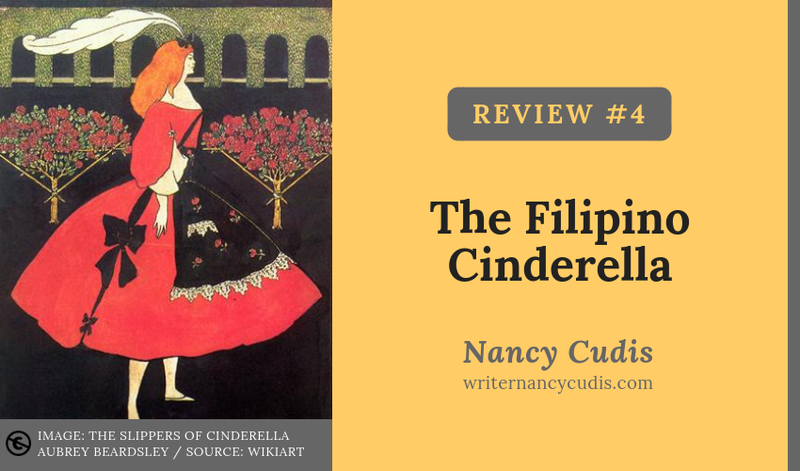 Abadeha, the Philippine Cinderella. This is adapted by Myrna J. de la Paz. While it contains the Cinderella formula, the landscape upon where the personalities move about is so characteristic of the Philippines. There is the river by which a lot of women’s tasks are done (washing, fetching water, and the like); there is the mention of a stingray to be used as a punishment whip; there are spirits roaming around and ancestors to be prayed to; there is respect for animals, including chickens, and trees; and there’s a chieftain who orders his son to use the drum to announce something. And Abadeha ran out to her coop where she found the dead chicken’s feet. Clutching them, she ran to the river, and again, the spirit appeared. She told her to plant the feet on her mother’s grave and pray to her ancestors, and the girl did just so. The rainy season came and went, and the girl went back to check the grave site. What a surprise she had! The chicken feet that she had planted had grown into an enchanted tree flowering with all sorts of treasures, such as rings, bracelets, necklaces, earrings, pearls, diamonds, and golden dresses. Mariang Isda. This is a Visayan story I found in Stories and Legends from Filipino Folklore by Sister Maria Delia Coronel, ICM. Her source is Lita Troyal from Matalom, Leyte, as narrated by Ardelia Calderon. Unlike the first two versions, this one tells of how sad Maria is at home in the company of her father and stepmother. Living along the coast, she saved and befriended a talking fish. The folks think her mad. This is how she got the nickname, Mariang Isda (isda is Tagalog for fish). One bright morning, the barrio people were astonished to find Maria gone. His father and stepmother inquired from all the people vainly for Maria was not around. People say the sea god had transformed her into a mermaid. Others believed the mysterious fish had taken Maria with her, never to come back to her cruel world. Until now, where Mariang Isda is, nobody knows. Perigrina. This is another Visayan story in the same book by Sister Coronel. Her source is Ernestina Dalugdog from Calape, Mantataog, Bohol, as narrated by Tonette Solatan. It has a unique combination of all the three tales above as well as the elements of Perrault’s version. It tells of Perigrina’s stress in the company of an evil stepmother and two stepsisters. Periang (her nickname) befriends a fish who sacrifices itself as food for her stepfamily in order to help Perigrina. The fish bones are planted and grow into an enchanted tree that blossoms gems and lovely gowns. Anzat her stepmother found out and grabbed the fruits Periang had gathered but she was instantly turned into a stone statue. Upon seeing this, Pukay and Kikay were alarmed and they lay flat on the ground and kissed the hem of Perigrina’s skirt, promising her that they would never be jealous and unkind to her again. Perigrina forgave them. Anzat regained her old self but they all learned a lesson to be kind and good always. What other old variants of Cinderella have you read or heard? Share with me and I would be glad to read them.